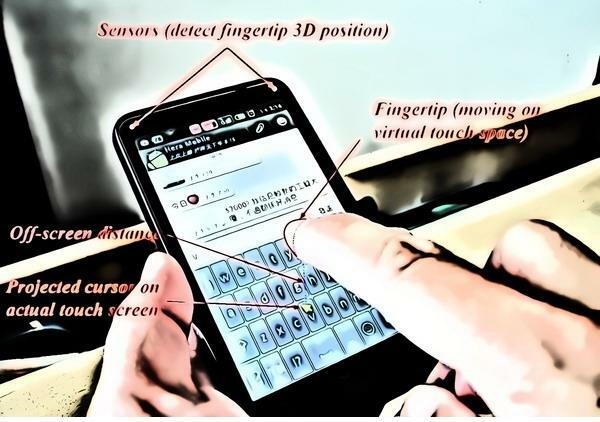 Virtual Touch Sensing is patent method that applied advanced 3D computer vision and motion detection technologies for resolving the bottleneck of touch control in small panel device such as smart watch, small sized smart phone and other hand held devices. It uses two or more sensors to detect the 3D coordinates of fingertip above the physical touch screen of a hand held device. Then it projects cursor on the respective coordination of touch screen. As the area of the operation surface of the virtual touching area can be much larger than the area of the actual screen, it allows user easily control the cursor navigating on touch screen accurately. The system can detect the touch motion of finger tip (finger tip move toward to the screen), it locks the cursor on the screen. If the cursor is rode on clickable widget, it can trigger the click event of the widget no matter where the screen is touched. So, through this mechanism user can easily control the device in a small hand held or wearable devices. Nowadays, no one will raise doubt the market potential of smartphone and wearable devices. There were over 990 million and 3 million units of smartphone and smartwatches sold in 2013 respectively. However, this is highly competitive market. Innovation is one of most important factors for success of their products. Users always expect new product will give them amazing user experience. This is an important driving force for them to renew their existing phone. My patent technology is perfectly matched of the need of market for next generation mobile phone and let the smart-watch not just gadget but usable and necessary device for daily life. The application is not limited as above, this technology can be applied to most of portable devices which need intensive interacting with user such as, digital camera and future palm-top PC with projection screen. So, the design is an evolution of touch screen control for any portable device. 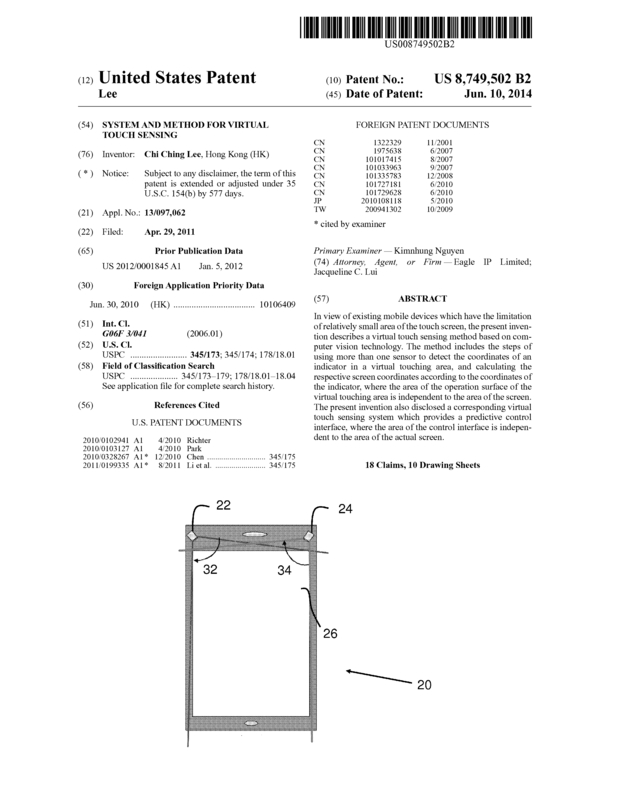 Page created at 2019-04-25 20:46:08, Patent Auction Time.